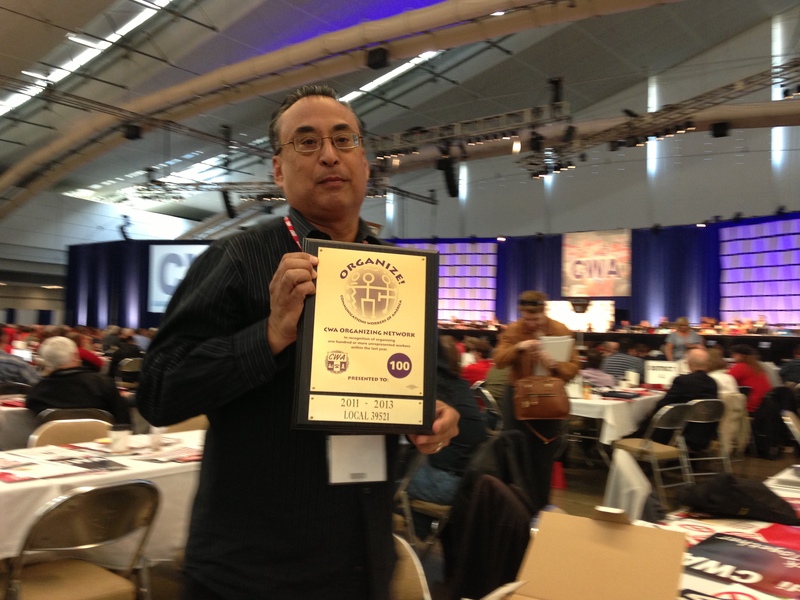 Mike Cabanatuan, former Guild president, holds CWA organizing award. Photo by Media Guild staff 2013. PITTSBURGH — Michael Cabanatuan, head of the Pacific Media Workers Guild local delegation to the 2013 CWA convention in Pittsburgh, accepted a special organizing award given to the local, recognizing our recent addition of Purple Communications, a large multi-state unit of sign language interpreters. The organizing work was led by staff of CWA District 9, based in Sacramento and Los Angeles. Bargaining is under way for the unit’s first contract. It was the fifth time the San Francisco-based Guild local has achieved the organizing award, and brings a $5,000 cash award from headquarters to continue our movement-building programs. Visit NewsGuild-CWA on Facebook for more about the convention.